I've mentioned one of my aunts before and how fabulous she is. Well, the truth is, I have 5 aunts and they are ALL fabulous. More than half are a little crazy too, but the good kind of crazy. Aunt Leann is possibly the craziest of them all. She is so much fun! I've never met a person who didn't like Leann. 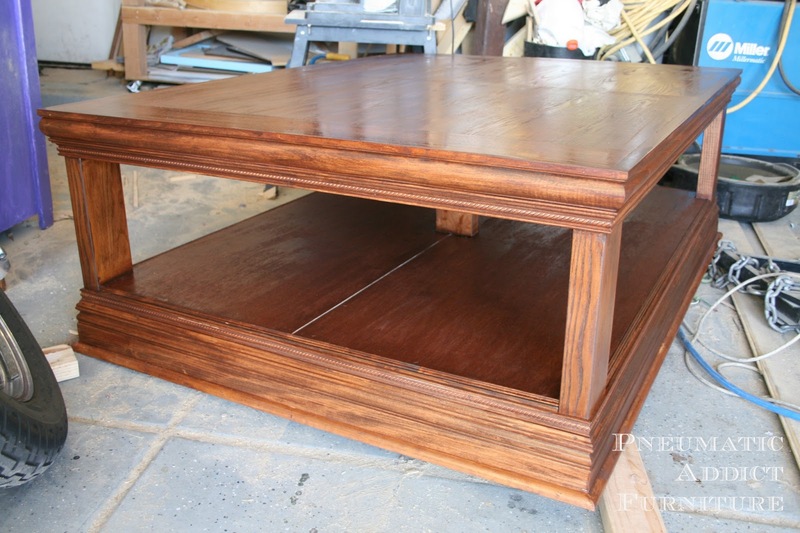 We've been talking for months about making her a new coffee table for her family room. A few years back, they enclosed their 4-car garage to make one GIANT family room. Its perfect for our huge family to gather and Leann and her husband are always entertaining massive groups of people. Well, an enormous room needs enormous furniture. Also, Aunt Leann and her girlfriends are know to have spontaneous dance parties, and almost always end up on top of the table. So this bad boy needed to be beefy enough to hold multiple, dancing women at one time. Enter the world's largest coffee table. 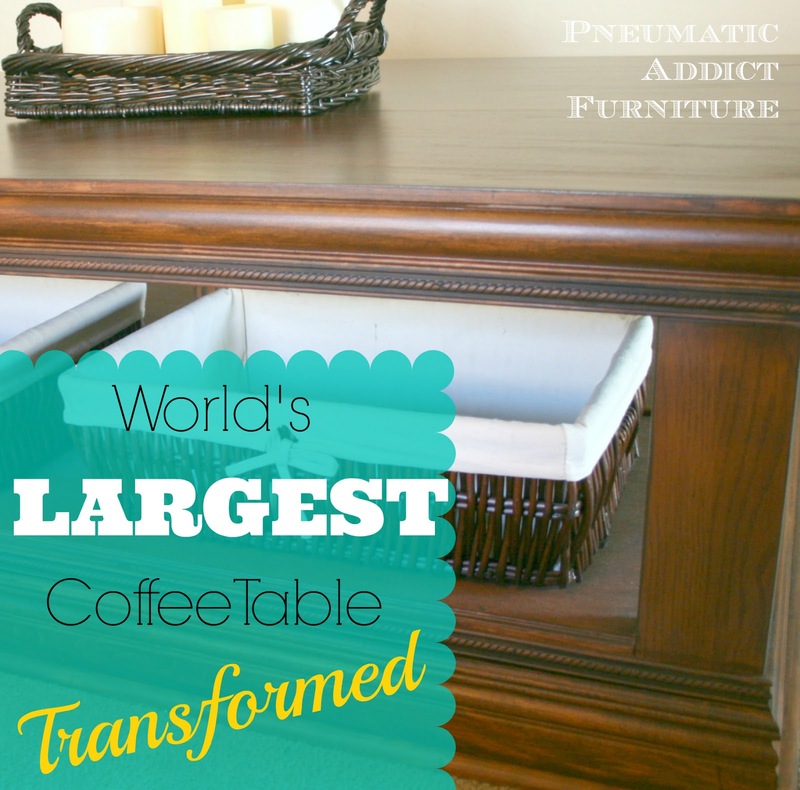 I'm sure there are larger coffee tables out there, but I sure haven't seen one. This thing is almost 4 ft wide and just shy of 5 ft long. My neighbor was moving and graciously asked if I would like to take it, or it was getting taken to the dump. So, I scored a solid, heavy, ginormous coffee table for free! The first step was to raise it up. It was 16" tall. On the low-end of average for a coffee table. Aunt Leann wanted it raised up quite a bit, so I dug through my scrap and found three pieces of 4 x 4 posts. After a lot of pre-drilling and counter-sinking, I attached the posts, horizontally to the bottom surfaces of the table with 3" wood screws. That did the trick perfectly of raising the whole table up 3 1/2 inches. The finish was in bad shape, and we were planning on going a couple shades lighter to match her existing furniture, so that meant it was time to bust out the belt sander. 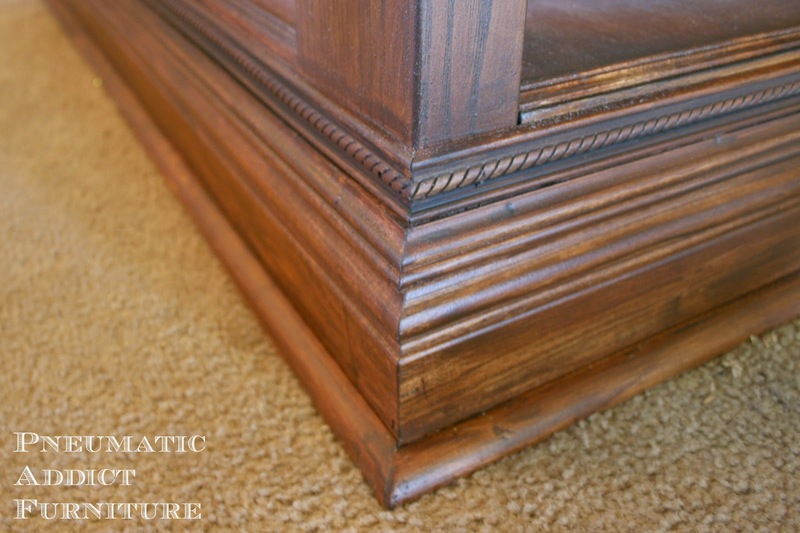 It was a huge pain in the rear to strip off the old, dark stain without damaging the wood veneer. I ended up using 120 grit and ultimately had to do a large part of the sanding by hand (definitely NOT fun). I didn't worry about the bottom rail because it was going to get covered up. I realize I chose a really difficult way to install a lower shelf, but the plan called for something different originally, and I modified it. My way involved 2 x 2's, some 1/4 plywood and a LOT of pocket holes. Because of the span of the table top, it has a support post in the middle. 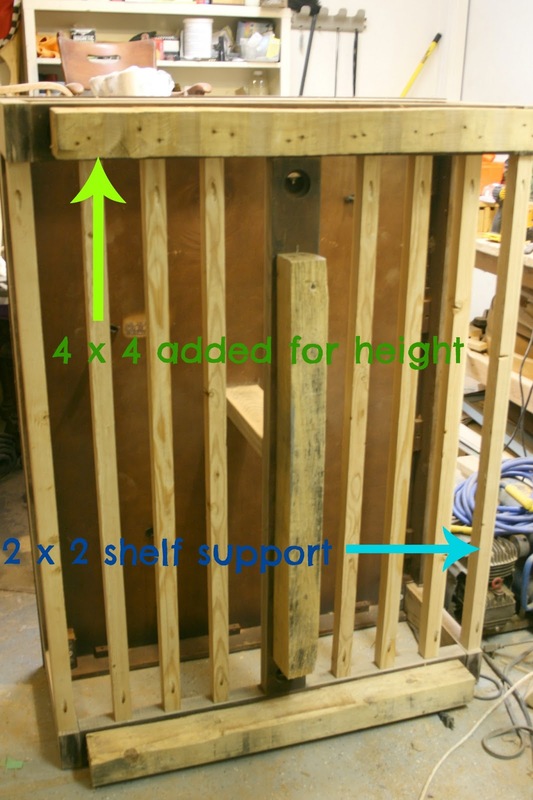 Great for adding support, but a HUGE pain for adding the plywood shelf. I ended up having to cut it in 2 pieces and cover the seam. Once stripped to bare wood, it was time to go crazy with moulding. I got to use the really pretty, stain-grade stuff. Man, that stuff isn't cheap! The baseboard and casing I used ended up being something like $2.50 a foot and is only sold in 8 ft lengths. That adds up fast! 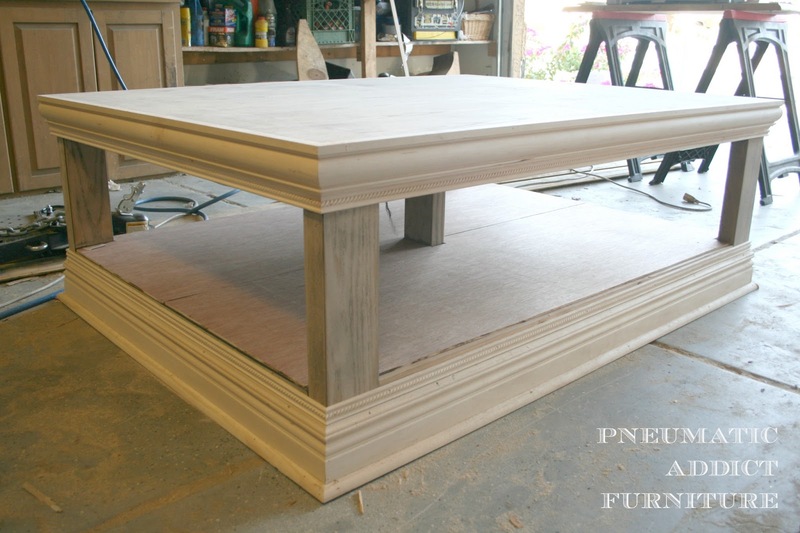 It was fun though, to get creative and start layering the mouldings. What difference some detail made! After filling and sanding, it was time to stain. 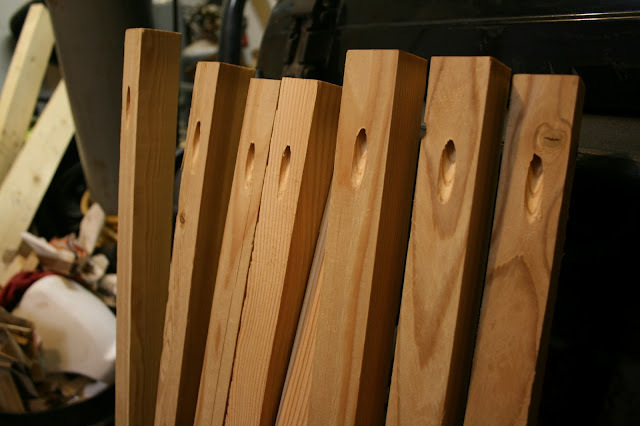 I first wiped on a coat of pre-stain conditioner, let it soak in for a bit, and gave another light sanding with 220 grit. The goal was to match her existing furniture. I tried 3 different colors on sample boards with no success before I finally wised up. "Why don't I just mix my own stain color instead of frantically trying to find the 'perfect' one". I finally settled on a blend of Minwax Gunstock and English Chestnut, with some Rustoleum Kona mixed in. 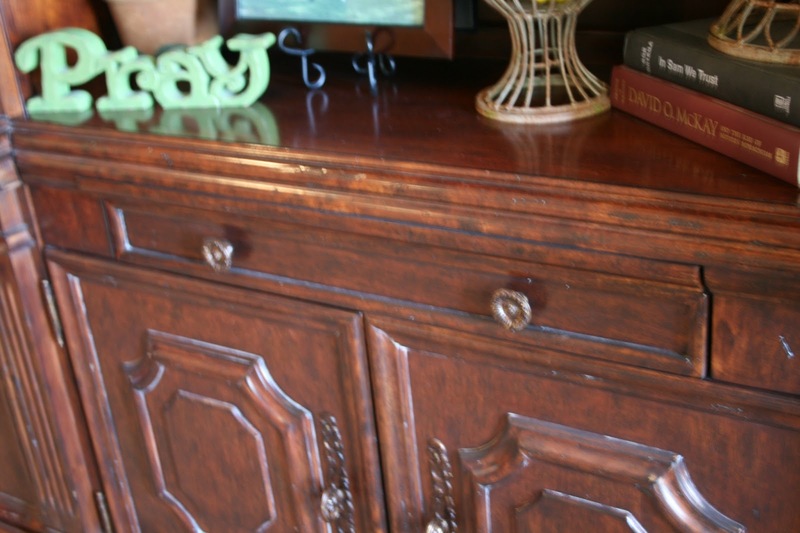 The color was good, but I decided I didn't like how much of the oak grain was showing and I wanted a little more richness, so I followed up with 2 coats of PolyShades in Antique Walnut. 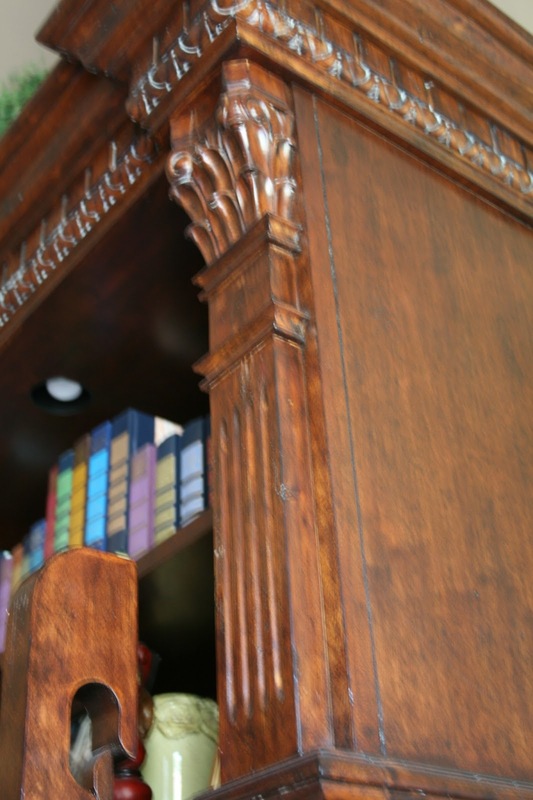 I've talked more about PolyShades in this post, but it is semi-opaque, so I like to use it when I want to cover just a bit of the wood grain. 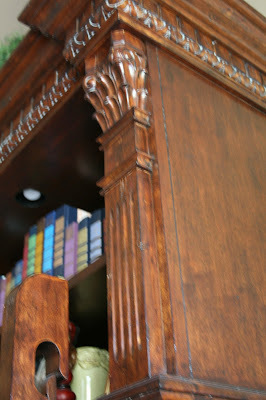 To bring out more of the detail in the moulding, I used some black glaze, only on the rope detail. To finish, I sealed everything in 4 coats of Minwax PolyAcrylic in Satin. This thing is going to be used for more of a dance floor than a table, so it had to be durable. 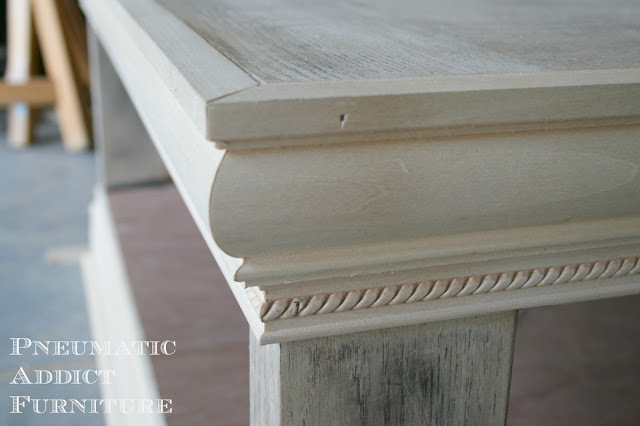 I LOVE the way the moulding turned out! And the top now is nice and smooth, and a little less oak-y. Wow! I love it!! You are definitely a girl after my own heart!!! Pinning it! 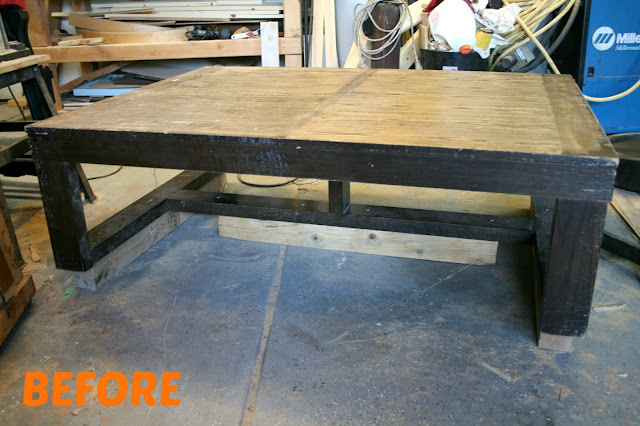 You did a fantastic job with this table, ginormous or not! Thanks for sharing your process in the transformation. Beautiful! Seriously, you really rocked it, girl. That is one amazing transformation!! This is so phenomenal!!! 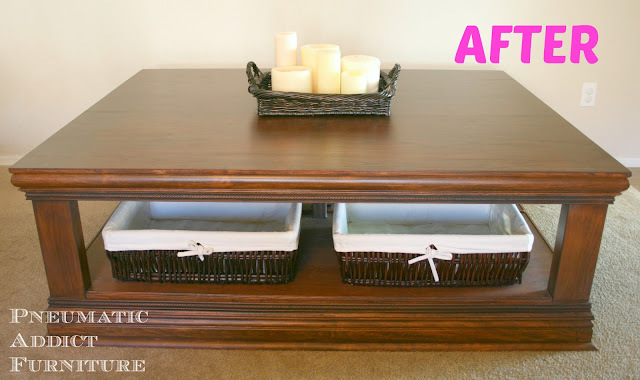 What a gorgeous table...what a transformation! I'm giving you a standing ovation!!! I'm very inspired to take some of my "not so ornate" stuff in another direction! That is very impressive! Great job getting it all to come together. You are quite the talented lady! You are so incredibly talented! Proud to be related!!! Great job! Hi, I'm visiting from Savvy Southern Style. Your remake of this table was totally ingenious. 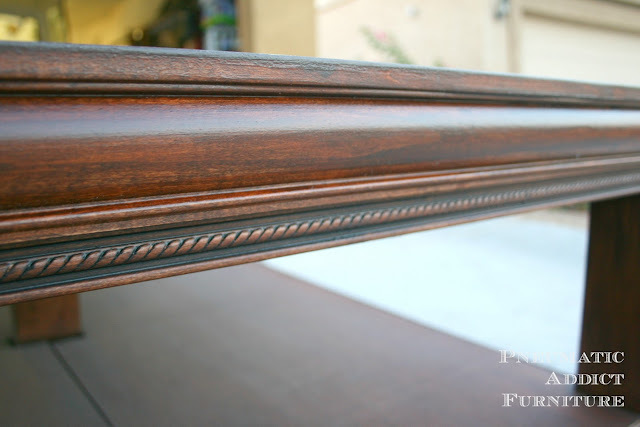 The mouldings you used to "dress" things up are awesome, and your staining technique and the solutions you came up with are truly inspirating. And what a lot of work, whew! My question is only this - do you have any concerns that the cross "brace" (for lack of a better of description because I'm not familiar with this type of furniture remake) that you used across the width of the bottom of the table to raise it up higher, since it does not run fully from end to end but is short by several inches on both ends, may cause some sagging of the shelf you installed on the lower portion of the table once the table starts to sort of "settle" in? 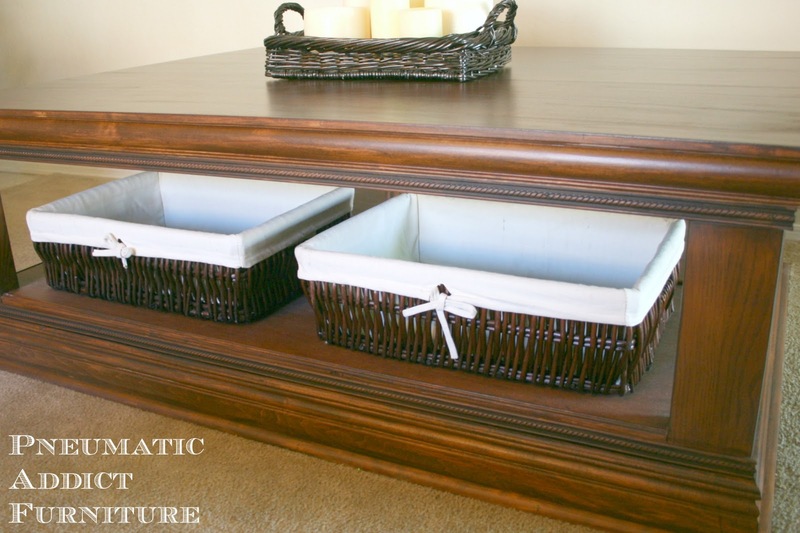 What if your auntie puts a lot of magazines, for instance, or books, inside those storage backets on the lower shelf? But honestly, it is an incredibly beautiful remake of this headed for the dumpster table. 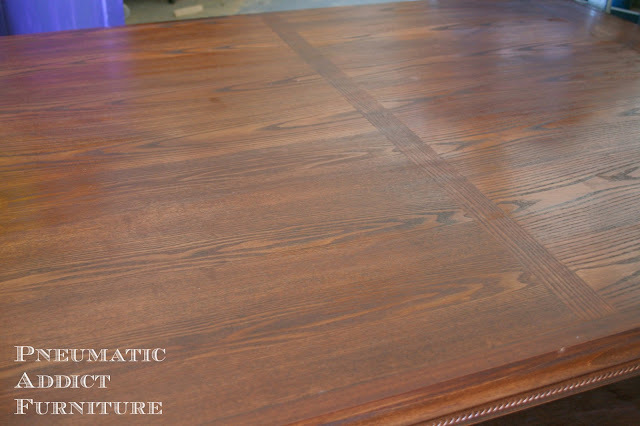 You are VERY talented and have amazing vision to be able to "see" the end results you are shooting for when you start out with something like this table looked! I salute you. I can't believe you did all this, but I can't believe you guys end up dancing on top of the table!! That is too fun! I just have to share this, what an amazing skill you have. I am seriously blown away. Thanks for sharing! Holy Cow!! This is AMAZING!! I am super impressed, I Love the moulding too!! I am so inspired, you ROCK! 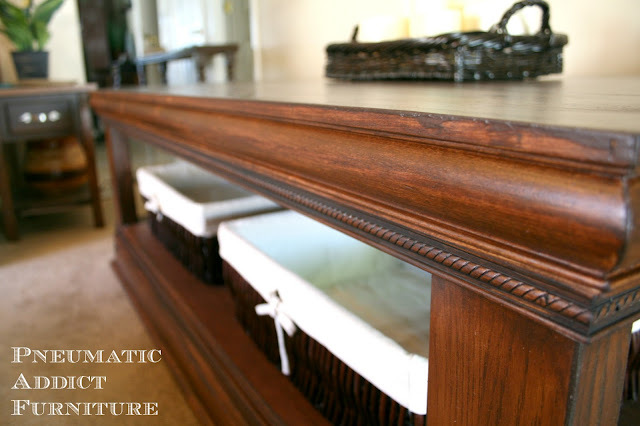 It is an incredibly beautiful coffee table. 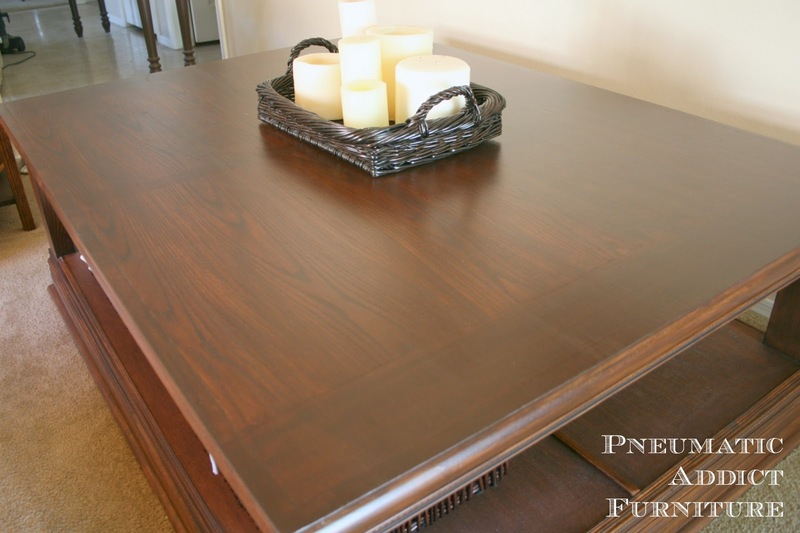 I must say that you are very talented and have amazing vision to be able to "see" the end results you are looking for when you start out with something like this table looked ! I like a solid piece of furniture! It is perfect! I would never believe that first table is the same one as the before, love the second. Oh, and you want cooler temperatures, today here the high was only 63, yes September this year means autumn, unfortunately.